After accumulating an arsenal of photography equipment, consisting of a couple of cameras, several lenses, a drone, and a tripod. You finally have the necessary tools at your disposal to travel to the most remote of places and capture something no one has ever seen before. Even though you have purchased the most high-end equipment, to ensure that you can take the best shot no matter the circumstances, one small little thing may have slipped your mind. How do you expect to carry around several thousand dollars’ worth of equipment, weighing well over ten pounds, up steep mountain paths and muddy humid jungles? In cases such as this, your simple run of the mill back pack just won’t cut it. When packing lenses, tripods, and your precious camera all into a general backpack you are truly setting yourself up for disaster. Not only do you have expensive equipment all beating up against each other, but in such adventurous places where many photographers tend to tread, you run the risk of severely damaging your camera due to the unpredictable weather or by simply taking a heavy fall to the ground. Thus, precautions must be taken to guarantee the safety of your electronics and the assurance that you can still photograph the most out of reach landscapes and destinations. The answer to keeping your camera and accessories safe and sound is quite simple: buy yourself a backpack for photographers. When browsing through these professional photographer’s backpacks, keeping your camera and lenses safe barely scratches the surface of what these cases can do. Along with being extremely durable and waterproof, some even have the ability to swing around on a belt, giving you quick access to your equipment so you can be sure to never miss a shot. Others even include hydration bladders along with various compartments and functions which are built into the backpack. For most travelers a backpack is so much more than a means to lug your equipment around, this will be the bag going with you on some of your most life-changing of adventures. It is crucial to find a backpack that will be with you every step of the way and not hold you back. This list compiles the best camera backpacks on today’s market that are suited for all different kinds of photographers. The wait is over, the famous rotating backpack is here. Mindshift has put an end to the constant taking on and off of the backpack with its rotating belt. This function allows the wearer to easily access his bag without ever having to take it off. 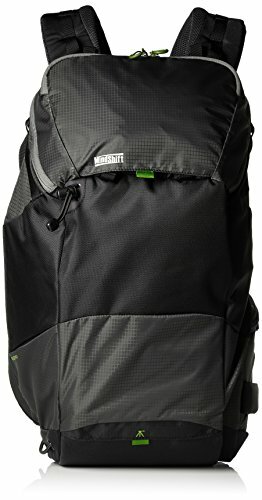 It’s one of the best camera backpacks for hiking. Other than this ingenious invention, the bag can accommodate a camera with a lense attached as well as an extra lense in the neighboring compartment. Just when you thought the bag couldn’t get any better, the Panorama also includes a 2-liter hydration reservoir. The sheer amount of points of access to the bag, as well as comfort make the Panorama worth its high asking price. The Thule Aspect DSLR backpack can carry a bit of everything. One camera, two lenses, a laptop or tablet, tripod, and even a small drone. Depending on what you want to carry, many of the compartments fold up to allow flexibility in what you may be hauling that day. Unfortunately, these dividers cannot be taken out of the bag. 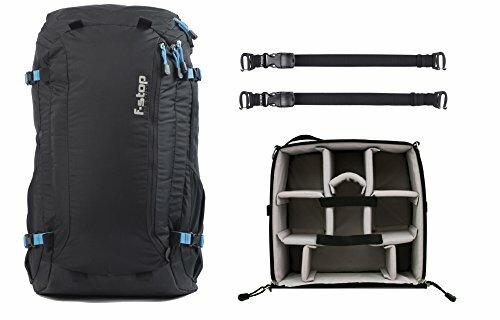 Similar to many backpacking bags, this camera backpack also includes a hip belt to take some of the weight off of the wearer. 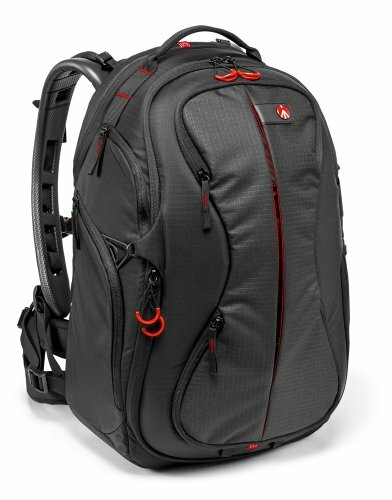 On top of the amount of camera equipment this bag can carry, it can also hold a laptop up to 15-inches in size. 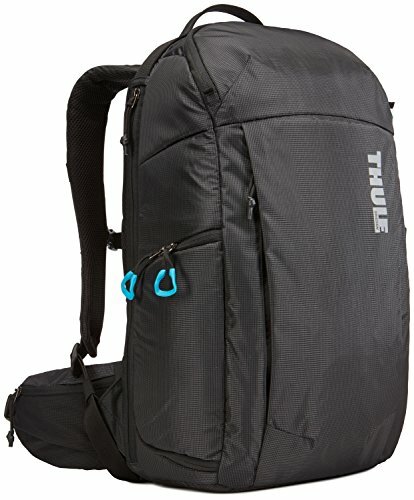 The Thule Aspect truly covers all the bases for a camera bag and for a moderate price. Even with a low-price tag, this camera bag still packs a punch with the number of features included in it. We had this bag for years before just recently upgrading to another LowePro. TheLowePro Flipside AW II can carry a camera with an attached lense as well as three other lenses, a laptop, and several jackets or even other articles of clothing needed for the trip at the top. On the side of the bag, it can even accommodate a tripod or bottle of water. The backpack also includes a rain cover for protection from all kinds of weather from monsoons to sandstorms. Comfort can be an issue, however, with the straps known to dig into the shoulders. 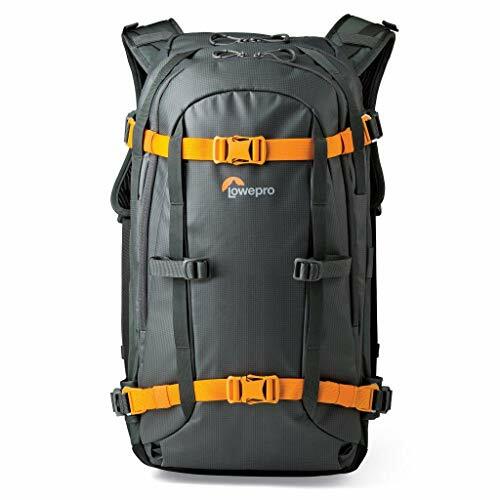 The Lowepro would be best suited for those going on short trips, no more than a few hours. Even though it is the cheapest bag on the list, the Canon Deluxe Backpack deserves a spot for its durability, water-proofing, and amount of storage. The Canon Deluxe can carry 2 DSLRs and from anywhere to around 4-5 lenses. 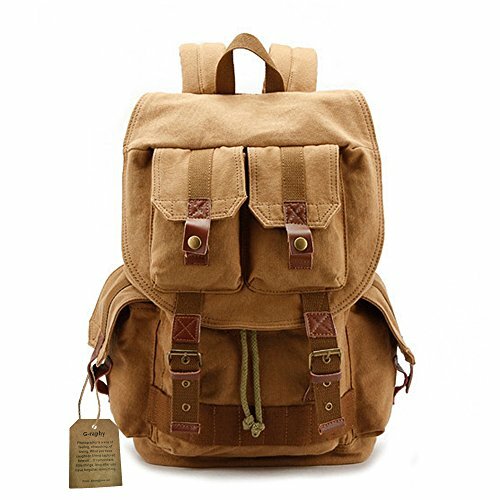 This backpack is not the most aesthetic looking bag, but makes up for its rugged appearance with practicality. Its sole function is to carry as much gear as possible and keep your camera safe. Although not the most comfortable of bags, it is definitely not the worst either. The bag itself is also lightweight, making sure not to add unnecessary strain on the wearer. 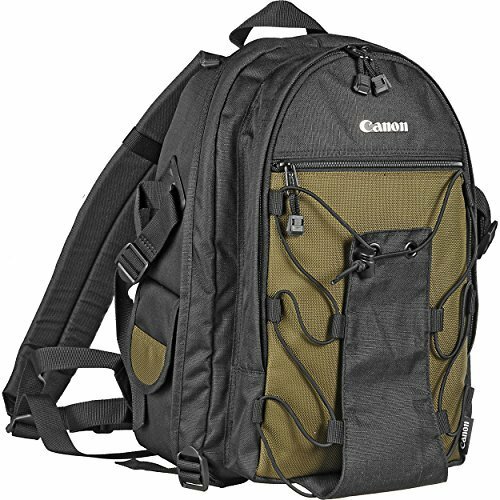 For its price and durability, the Canon Deluxe is one of the few bags that will continue to work for you for years to come. The first thing you may notice about the ProTactic 450 is the ease of access to your equipment inside of the bag. The compartments are all completely customizable, allowing you to determine which equipment will be needed to be carried on your shoot. Also, the number of zippers allow your camera and lenses to be available at any time when needed. The ProTactic 450 can also hold a 15-inch laptop in a dedicated pocket guaranteeing its protection. Comfort is also a big part of the ProTactic 450. This bag includes lumbar support as well as a hip strap. Although priced a bit high, this is one of the best camera bags one can buy on the market today. 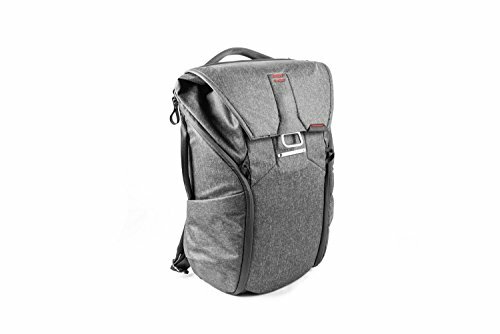 This smart looking bag is definitely geared towards your urban explorers and a very stylish camera backpack for photographers. The interior partitions can be easily adjusted either for everyday use or accommodating two lenses and your camera. This compact bag is more meant for the casual photographer rather than the professional going out on a shoot. What the bag lacks is properly utilizing every inch of the backpack, many spaces seem to be wasted and are not possible to add in the rest of your gear. Even with the wasted space, the Peak Design does offer compete for customization of the interior, therefore the usage of space is determined on if you are using it to haul camera equipment or your everyday items. Even though this camera backpack is slightly expensive, with the amount of usage you get out of the bag and its sleek style, it is sure to turn into your daily go-to bag. This camera backpack is extremely durable, can hold a camera along with four lenses, and is even water resistant. Access to your camera is quite easy as well with its front and side opening pockets. The backpack is made to take care of your camera equipment and even your laptop, but it doesn’t leave a lot of room for much else. The usage for this bag is limited to carrying only your electronics, with not much space for a change of clothes or hauling anything else you might need on a shoot. If all that you need is a sturdy, lightweight bag, dedicated to holding as much equipment as possible without sacrificing comfort, then this bag is for you. 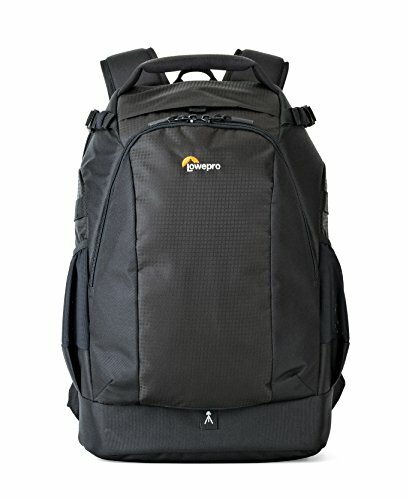 For those on a budget the i-graphy backpack is one of the most economical camera backpacks you can buy. The first thing that is sure to grab your attention is the design of the bag. The canvas exterior and decorative buckles have the appearance of something straight out of an adventure novel. Sadly, the most beautiful part of this bag is known to be poorly made. This waterproof camera bag can carry two cameras and anywhere up to 5 lenses. There isn’t much room for a laptop, but can accommodate a tablet. The i-graphy can also be easily converted into your day to day backpack, making it perfect for any occasion. The budget priced Evecase Classic should definitely be on everyone’s list when looking at potential camera bags. 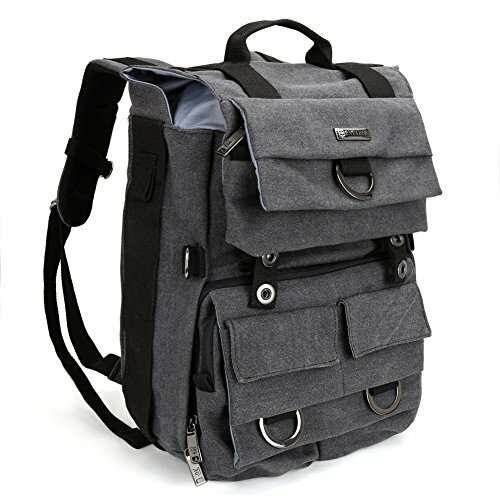 This canvas backpack can hold a professional camera as well as up to around four lenses. With all that this bag can carry it can get quite heavy. The Evecase Classic does include chest straps; however, it lacks a frame which will take the weight off of the photographer. If you are of a bigger stature, the many full pockets and compartments may not affect you in the slightest. If you are smaller, however, this bag may carry more than you can handle. If you are able to distribute the weight properly, this can be the perfect bag for any occasion. The F-stop Loka is aimed at standing the most extreme of the elements. Although small in size, this camera bag has many compartments that can hold your camera as well as several lenses. The aluminum frame and padding on the straps on the backpack will ensure that you are comfortable while hiking as well as allowing the freedom of movement. One of the major issues with the Loka is that the cameras can only really be accessed from the back zipper. Even with this minor setback, the F-stop Loka is one of the best backpacks on the market. This is the latest addition to our collection of backpacks and I couldn’t be more stoked on the bag. The camera bag is purpose-built for those who shoot photos and video in the harsh elements, specifically winter conditions such as climb or ski. It’s definitely one of the best backpacks for photographers, but it does come with a high price tag. Since it is designed for tough winter elements the build quality and design are truly impressive. I love that the bag opens from the backside that allows for you to comfortably throw the bag on the ground and reach for gear without fear of the bag tipping of getting gear wet. It also has side and front straps designed to carry a snowboard, skis, ice axes, or hiking/ski poles (massive win for our snowboard season). I like the pullout rain cover for heavy weather. The suspension system is also the most robust I’ve found in a camera bag so far, which is great when carrying 40lbs of gear up a hill. My only complaints would be the size of the top compartment which would be great for storing thing like a phone charging cables, or whatever accessories I may need on the mountain. There is a front compartment on the bag, but it’s one large section directly next to the camera gear so it needs to be able to bear weight. I’d also love a water bottle holder on the sides. For carrying such a large bag designed to be outdoors I need some form of hydration. As a photographer, the first thing you want to consider when looking at backpacks is, of course, how you can protect your slew of expensive equipment. It doesn’t matter if you are going out deep into the wilderness or simply exploring your city, the amount of a beating electronics can take is severely limited. What you need is a bag that will be able to repel water just as well as it can absorb a fall to the ground. 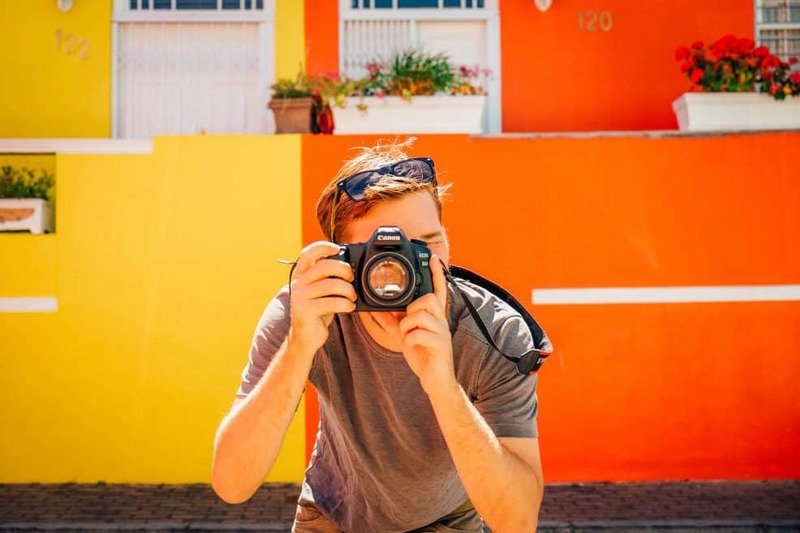 When spending so much money investing in your camera, an amount should also be used to buy a durable backpack to protect your priceless equipment. Surprisingly, camera bags are not cheap. For the best shock absorption, waterproofing, comfort, lightweight, and numerous compartments you must be prepared to pay top dollar. 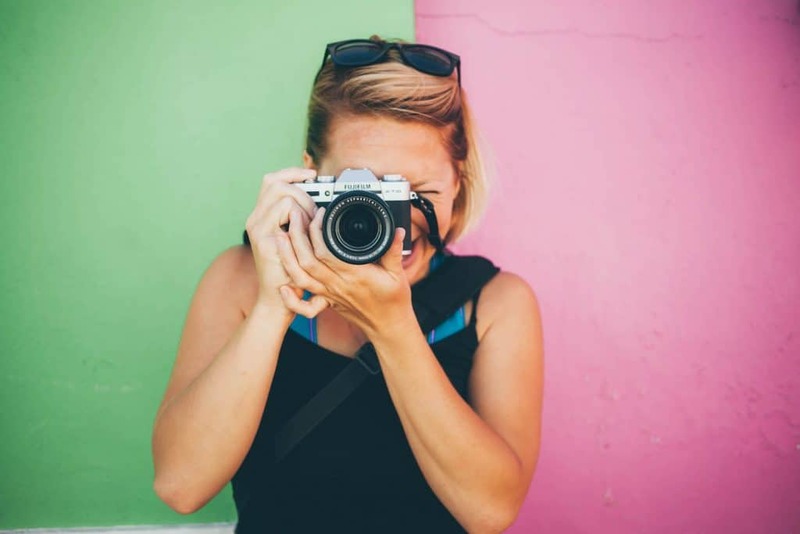 Even though you may just be getting started as a photographer or be on a tight budget, that does not mean that you can’t keep your equipment safe. 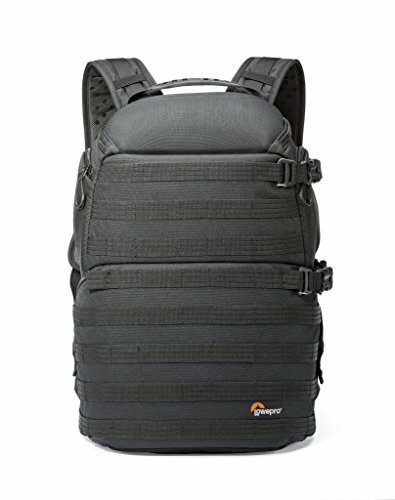 Our very first backpack for photographers was a Lowepro. Most importantly, photographers need to decide what are their exact needs for their camera backpack. While on a budget, it may be necessary to sacrifice durability for comfort. There are other options, however, where you can still get the most out of your equipment and still have enough money to spare. Cameras, lenses, drones, tripods; all the equipment the average photographer carries around nowadays slowly adds up to the point where they will be buckling under the sheer weight of their backpack. Ours weighs just under 50 lbs – no joke! The goal of many of these bags is to take the pressure off of the wearer’s back to allow the freedom of movement. Nothing is worse than going on a hike or exploring rooftops and being hindered by the very equipment necessary to get your perfect shot. Taking the strain off of your back and to properly distribute the weight in a camera backpack is the gamechanger between a miserable trip and an excellent photo shoot. Many photographers and travelers have painful memories of their backpack’s straps digging into their shoulders and ribs. The constant adjusting and readjusting of the harnesses quickly becomes a nuisance. Itching as well as twitching under the poorly made material and lack of padding is sure to ruin any trip. It goes without saying that in order to truly focus and be immersed in your surroundings, your attention should not be on the pain pressing down on your back. With cushions, a well-built frame, as well as weight distribution, your camera backpack will be sure to keep your equipment safe without the painful reminder that you are carrying several pounds of equipment on your back. A factor many photographers may overlook when choosing their camera backpack is how easy they will be able to access their equipment when suddenly running across the perfect shot. Many people may find themselves stumbling with taking off their bag and then fumbling with the zippers until finally, the opportunity has slipped through their fingers. Modern camera bags not only have your cameras and lenses organized in such a way that they are ready to be pulled out on a moments notice, but today’s bags even have the ability to swing around on a belt, allowing access without even having to set down your luggage. Some of the best pictures are those that are not planned, therefore it is critical to always have your tools ready at hand.